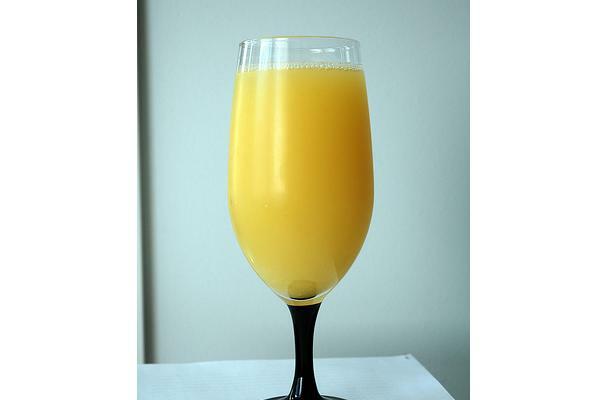 Orange juice is a popular juice beverage often used at breakfast time. This juice is high in vitamin C, folic acid, potassium and flavanoids, making it very nutritious. Some of the nutrious properties may be lost if the juice is heated or even frozen. Whenever possible drink it freshly squeezed. Orange juice is available freshly squeezed (best), in concentrate and canned. It is often mixed with other juices or in cocktails, and can also be used to marinate meat. Orange Juice is a liquid orange substance that comes from orange fruit when squeezed. When not filtered, fresh orange juice is pulpy when tasted. Choosing: * “Best By,” “Best if Used By,” and “Use By” dates on commercially packaged foods sold in the United States represent the manufacturer's estimate of how long the product will remain at peak quality — in most cases, the unopened juice will still be safe to consume after that date, as long as it has been stored properly and the package is not damaged. Buying: You can get Orange Juice from your local grocery store or supermarkets. Procuring: Made from orange by extraction from the fresh fruit by desiccation and subsequent reconstitution of the dried juice or by concentration and subsequent addition of water to the concentrate. Orange juice can be used to mix with other drinks, smoothies and breakfast drinks and can add flavour and zest to your dishes, sauces and glazes. * Discard all juice from cans that are leaking, rusting, bulging or severely dented. * Pantry storage time shown is for best quality only — after that, the juice's texture, color or flavor may change, but in most cases, it will still be safe to consume if it has remained unopened and been stored properly. * Freeze in airtight glass or plastic container and leave at least 1/2 inch headspace at the top, as juice will expand when frozen. * Freezer time shown is for best quality only — foods kept constantly frozen at 0° F will keep safe indefinitely. History: Oranges have been growing in Southeast Asia and China for approximately 4,000 years. According to historians, the orange made its way to Africa and the Middle East within the next five centuries and eventually came to Europe during the Arab occupancy of Spain (about 700 to 1400 AD). Explorers brought them to the New World in the 15th and 16th centuries, and by the 1800s, Florida had a burgeoning orange industry. By the 1890s, oranges and orange juice grew in popularity when it was discovered that the fruit contained a wealth of Vitamin C. Doctors knew that Vitamin C would help stave off a very menacing disease of that time – scurvy. The commercial orange juice industry arose in the 1920s and consumption of OJ began to increase in leaps and bounds, especially when pasteurization techniques and new canning processes improved in the 1930s. Orange juice now tasted better and was safer to drink. Frozen concentrate was invented near the end of World War II and for four decades was the best-selling orange juice on the market. Its popularity helped spur the growth of the Florida orange industry. It wasn’t until the mid-1980s that ready-to-drink (RTD) juices outsold the frozen variety. Today, more than 75% of North American consumers drink the RTD varieties while about 25% have maintained loyalty to frozen concentrate.